I'm a successful children's content editor with a 15-year track record of identifying great storytelling and coaching writers to their most delightful use of language. I love working with authors, helping to build and grow their careers. I edited five books in a series called Complete and Explained for Scholastic Book Clubs' Storia e-book app. We selected documents that were on the Common Core exemplars list. 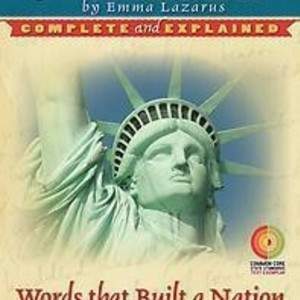 These included the Declaration of Independence, the Constitution of the United States and the Bill of Rights, The New Colossus (poem on the Statue of Liberty), the Gettysburg Address, and the Declaration of Independence. These are docs recommended be read—and understood—by eleven- and twelve-year-olds. Even the briefest of these docs, however, are pretty dense and use archaic English, so we “translated” them. First, we included the text verbatim, then section by section, we re-wrote it, using modern language. Then we explained the context of the document and the reason the words were chosen. As an example, we explained what “we hold these truths to be self-evident” means using words today’s students understand, then we gave some background about why the writers of those words felt it was necessary to say so—that they wanted to make it clear that the rights they were claiming weren’t up for debate, but were inherent to the human race, no matter your country. Note: Storia is a proprietary e-reading app available only to Scholastic Book Clubs teachers and schools, so the books described above are not available to the general public. I teach Children's Book Publishing at Portland State University. The class is part of their graduate program in Book Publishing. We cover almost the entire gamut of books for children, from board books to chapter books to graphic novels (there's a different course focused on middle grade and YA), from Trade books to those geared toward the education and library market. And we cover editorial, marketing, sales, even production and legal issues. I draw on all of my publishing experience as an acquiring editor of audio subrights, a list manager of an ebook subscription program, an editor of licensed books from Disney and Nickelodeon, and a my more traditional roles as a copyeditor and project manager. I run baby storytime for Green Bean Books in Portland, Ore. Each week I select a different theme, and then read books and sing songs pertaining to that theme. For example, an "outdoors" theme includes songs about the weather, trees, and squirrels, and books with similar themes. I incorporate movement and parent-baby interaction as much as possible. I coach writers and authors in finding their voice, honing their plot, and identifying their target audience. I offer guidance about how to appeal to agents and editors, and in working with publishers of all sizes. I edited nonfiction picture books for toddlers, kindergartners, and first graders, as well as a short series of e-books that explained and gave context for major historical documents and speeches for upper elementary students. I was also the editorial manager for Storia, Scholsastic's proprietary e-reading app, which means I was a curator, of sorts. I created book bundles around seasonality, topic, reading level...you name it, using my deep knowledge and understanding of children's reading habits and interests. I selected the most exceptional, most interesting, most informative children's and teen books for inclusion on our children's audiobook list. We acquired from all major US and Canadian publishers, so I developed a high level view of the industry and an eye for what works. Government Technology is a nationally distributed magazine the covers, as the name suggests, technology and its uses in the state and local government sector. Technology can be hard to cover for the layman, and government workings tend to be dry, so I worked with writers to craft articles that were informative and clear, but still eloquent. I ensured writers maintained the tone of the magazine without sacrificing their unique voice. And of course, I edited for accuracy, grammar, spelling, etc. Travel around the world and meet animals with Mickey and the gang! Discover the secret of princesses with Sofia! Very helpful and I learned a lot, just from her communication. Excellent response time and knowledge. Nevin , as usual is a joy to work with. She is very professional and thorough. She is also quick and precise. I love working with her. I hope to work with her with all of my projects if she is available. Nevin did a wonderful job on my proofread. Her offer was very clear and detailed. Her communication was very thorough. She met or exceeded all deadlines. I will use her services again for future books. Nevin did a good job editing my work. She was professional and timely. She was patient with me and made my work better. I will use her again. Join Reedsy to request a free quote from Nevin and over 1,000 similar profiles.